(Photo: Reuters /Andreas Solaro / Pool)Pope Francis (R) and the Coptic Orthodox leader Tawadros II pose during a private audience in the pontiff's library at the Vatican, May 10, 2013. When Pope Francis met with Pope Tawadros II, the head of Egypt's Coptic Orthodox Church spoke an urgent need for unity among Christians in the Middle East. The Egyptian is only the second Coptic pope to visit the Vatican. On the day he visited, however, there were three popes in the Italian holy city including Pope Emeritus Benedict. His visit to the Vatican and Italy which started on May 9 ends on Monday. With 11 million members, the Egyptian Coptics are the country's biggest Christian church in a country where the 85-million population is overwhelmingly Muslim. "We must prepare our people for this very real and needed unity that we know and live, we must work quickly and seriously," said Pope Tawadros in his May 10 remarks provided to Catholic News Agency by his office. Pope Francis in his reply said, "Let me assure you that your efforts to build communion among believers in Christ, and your lively interest in the future of your country and the role of the Christian communities within the Egyptian society find a deep echo in the heart of the Successor of Peter and of the entire Catholic community. The Catholic pontiff said "the sharing of daily sufferings can become an effective instrument of unity." He added, "From shared suffering can blossom forth forgiveness and reconciliation, with God's help. Tall black-clad Tawadros, aged 60 and white-robed Francis, 76, made no mention in their public statements of recent violence in in Egypt between majority Muslims and Christians. Such sectarian violence that is replicated in other Middle Eastern countries has provoked many utterances about how dangerous it is for Christians in the region and that is an endangered faith there. 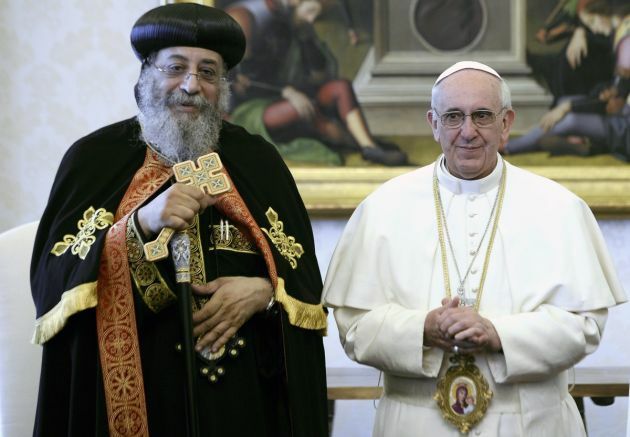 Tawadros invited Francis to visit Egypt and suggested the two churches should observe May 10 as "a celebration of brotherly love between the Catholic Church and the Coptic Orthodox Church." 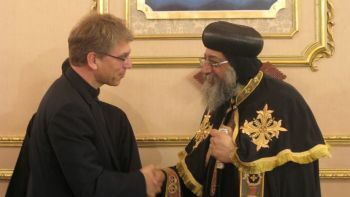 (Photo: WCC)The general secretary of the World Cuncil of Churhces, Olav Fykse Tveit, with the Egyptian Coptic Orthodox Church's Pope Tawadros at St Mark's Cathedral in Cairo, Egypt, 2013. The meeting between the Catholic and Oriental Orthodox Popes came 40 years to the day after the historic encounter between Pope Paul VI and Tawadros' predecessor, Shenouda III. They signed a joint statement pledging the two churches to the search for reconciliation and unity. Pope John Paul II returned the visit to Egypt in 2000. The Egyptian Coptic Church is currently a member of the World Council of Churches, which groups mainly Anglican, Orthodox and Protestant Christians and does not include the Roman Catholic Church, although it cooperates with it on many levels. WCC general secretary, Rev.Olav Fykse Tveit, met Pope Tawadros at St. Mark's Cathedral, Cario, site of attacks earlier in April following a funeral for Christians killed in a northern Egyptian town only a few days earlier.